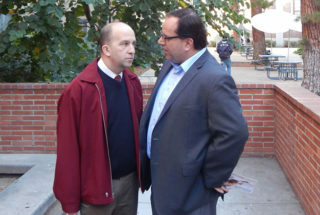 LAUSD board President Steve Zimmer with UTLA President Alex Caputo-Pearl at a union protest last year. Los Angeles is days away from the finish line in the most expensive school board race in U.S. history. So it’s all about money. But what money, exactly? The $11.4 million in campaign spending? The $1.6 billion projected deficit for LA Unified? The nearly $1 billion in state funding that has left the district, as more than 100,000 students have fled their traditional neighborhood schools in the past decade for charter schools and other school districts? No. The real money, experts and district watchers say, is the value of LA Unified’s union contracts — and it’s barely come up during the campaign. While pro-charter groups have poured millions into the race, the teacher union has spent aggressively too. The clear concern of the union is that if reform candidates win, it will be much harder to win big raises or protect generous retiree benefits. This summer, 11 union contracts will expire. The largest is for the district’s 33,000 teachers. Teacher salaries make up 42 percent of the district’s $7.6 billion budget. Last time around, the school board — with the same 5-2 pro-union majority it has now — approved a 10 percent raise for teachers, which was more than the union was asking for and in spite of the district’s projected deficits. Also at stake is whether LA Unified will continue providing free lifetime health care benefits for retirees and their dependents. It’s the only school district to do so among large districts throughout the state, according to a district report. LA Unified projects that the unfunded liability for retiree health care benefits is $13.6 billion, and district staff has warned year after year that the district must start paying down that debt, but to no avail. He said municipalities and school districts around the country are facing the same issue when it comes to pension obligations. “I don’t know if there’s a clear strategy that’s been developed around how to do this,” he said. Voters will choose two school board members on May 16, and if reform candidates win both seats, they would shift the power of the board away from a union majority. The stakes are high, evidenced by the record-setting campaign spending and an avalanche of ads, many of them negative — not seen to this extent in other cities across the country. What’s fueling the spending, experts say, is that LA has an organized opposition in the charter community to the teacher union. In many other cities, unions dominate the landscape and their candidates roll easily to victory. In places like New York and Chicago, the mayor appoints the school board, so unions concentrate their money on mayoral races. But with so much at stake, LA’s union, United Teachers Los Angeles, is putting up a big fight. UTLA has spent at least $3.6 million to re-elect board President Steve Zimmer in District 4 and on Imelda Padilla in her run for District 6’s open seat, according to LA City Ethics Commission filings. And that’s just the amount that’s been reported. Some of its advertisements are being investigated by the state’s Fair Political Practices Commission to see whether the union violated campaign finance disclosure laws. It is unknown how much UTLA has spent on those ads. The LA union has been preparing for this electoral fight for at least two years, with a war of words, dollars and political muscle. “We must face off against the billionaires again in the school board elections of 2017, and we must win,” Caputo-Pearl said at the conference, explaining that the next board would vote on a new contract. He said the union needed to help elect a board that would resist a “vigorous campaign to cut our benefits” by district leaders. More than a year ago, UTLA’s membership voted to increase their dues by a third to about $1,000 a year to stock its war chest ahead of the school board elections. The union has also started a “We Are Public Schools” media campaign railing against the “billionaire privatizers” for the purpose of influencing its bargaining position. It also commissioned a widely criticized report that concluded that oversight of charter schools costs the district money, something the district’s own data disproved. Caputo-Pearl won his second three-year term in February, in part on the promise of protecting teachers’ health and retiree benefits. A UTLA spokeswoman did not respond to a request for comment. Richard Garcia, a spokesman for the California Charter Schools Association, which has endorsed Nick Melvoin and Kelly Gonez, said the UTLA contract expiring at the same time of the election helps the teacher union encourage its members to participate in the election. Ben Austin, former executive director of Parent Revolution who is working for an independent expenditure committee supporting reform candidate Melvoin, said he hears parents talking about this issue when he drops his daughters off at school. “Parents are concerned,” he said. The district is at an “inflection point” where it could slip into bankruptcy, Austin said. Zimmer has acknowledged the retiree health benefits need to be addressed but he has vowed not to touch current employees’ packages and, rather than acting with urgency, he stresses the importance of building trust with the district’s negotiating partners. His opponent, Melvoin, calls the situation a crisis and has proposed that new hires be paid more up front but receive fewer retirement benefits. Larry Sand, a former LAUSD teacher who founded California Teachers Empowerment Network, a nonpartisan, nonprofit organization that seeks to educate teachers and the public about union and school choice issues, said if Melvoin and Gonez are elected, he would be optimistic that the board would address its unfunded retiree benefits liabilities. Sand is a Melvoin supporter. “If both of them get elected, and that’s a big if, I think it could bode well for everyone in Los Angeles because both Gonez and Nick are pro-kids,” Sand said. The candidates have said little about the upcoming union negotiations or the contracts. In about a dozen candidate forums, the issue has been raised only twice. The hundreds of mailers and advertisements that have been paid for by outside groups have largely ignored the issue. All four candidates agree current benefits are unsustainable. The question is how quickly they would move to negotiate with union partners. “I don’t know how they do this without sometime making harder decisions around layoffs and closing schools,” Noguera said.